The first image is a drawing I made about 7 years ago of a sort of fantasy landscape, which I have always wanted to make into a quilt- but somehow never got around to it. But as I am teaching the on-line linocutting class ( and there are still 2 places for the course starting 14 August) I have been scouring my line drawings for making into lino-cuts as examples. I am really pleased with the way this landscape turned out- the line drawing really lent itself to being reinterpreted into lino. And Nicole pointed out to me that The Jumeiux Cathedral post was in fact not Jumieux but Jumieges Abbey, which Victor Hugo considered the most beautiful ruin in France. The other photo is of a very picturesque village house in Jumieges.. I finished the quilt in order to enter it into the Ozquilt art quilt thing- got everything ready and then saw the exhibition dates-the exhibition does not finish until 17 December, and by That stage we may already be overseas- and we certainly won't have a fixed address.The quilt measures 52 cms by 127 cms long and is whole cloth stitched silk. It is for sale if you are interested for $750 US. The inspiration for this piece is waterways of my childhood. Colombo Creek was near the station ( large large farm) where we lived - and on hot summer evenings we would go down there and take a splash- the creek wasn't really that deep and the waters were black with tannin form the gumleaves. You had to be careful for snags ( submerged branches) and the leeches were always there so we always took salt with us.We also saw a snake taking a dip one day too- but somehow that didn't deter us- guess it must have been hot! I am an air sign but am also the water carrier and I am always drawn to rivers and creeks ( and way back when canals) much more so than the sea. I wonder what state Colombo Creek is in these days- does it still run? I have been stitching on my Colombo Creek piece- I am not sure that I will get it done for the Ozquilt call for entries- there is a long way to go still and the stitching is taking a long time. But it has given me food for thought for a series of work around the idea of creeaks and rivers and canals that I have known since being a small child. I am the water carrier, even if I am an air sign, and water is such an important part to our existence and we are so wasteful with it. 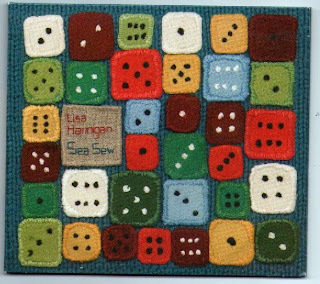 The seocnd image is a cd cover for an album entiled "Sea Sew" by Lisa Hannigan. Lisa is Irish and I saw her on Youtube after someone mentioned her youtube on a blog ( and I can't for the life of me remeber whose blog it was). I loved what I heard and saw- a clip in a pub in Dingle which I went to many moons ago- and have been on the lookout for the cd since. My daughter found it in Sydney on the weekend and bought it for me- and it's wonderful- it is kind of jazz, folk and celtic- and the lyrics are wonderful . The cover is knitted and stitched made by Lisa and her sister and the lyrics and acknowledgements have been stitched on irish linen!!! Thanks for the commisses about having to move- I am actually feeling rather sanguine about it-the house has allowed me to come to some sort of peace and for that I am grateful- it is good that it is transitory in a sense, because now I can move on to new dreams and places. And I will!. 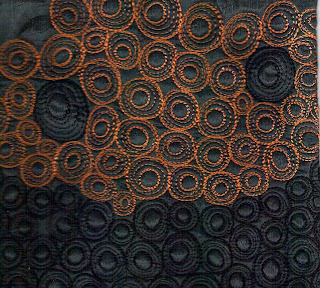 I have been working on a piece of charcoal coloured silk. I wasn't expecting to be working on it at all- but suddenly an idea arrived that I just had to do- fortunately I had just the piece of grey silk that I had dyed ages ago- I am thinking of the dark dark coloured waters of the creeks in summertime out the back of Jerilderie- and the dry dusty summers ..... It might be a companion to my flag piece. I had some bad news the other day- we had hoped to stay in this house until January when we go to France- but unfortunately the landlord wants his house back as soon as possible after our lease expires- I think they will let us stay until my eldest daughter has finished exams mid November, but then we have two months of limbo. I am thinking hard about what I will do.All our furniture has to go into storage- lots of packing up to do! I also want to put my block of land on the market. I haven't organised any workshops for January in Europe- but if we go earlier I do need to be earning money as we need to organise a car and various other things, and I haven't sold much work at all this year. I have been lucky that I had the books. However we have found a home for our cat- so that is one worry out of the way, and she knows one of the people already- so that is even better. Those of you who expressed intereste in the on-line linocutting course and left comments- please email me through my profile ..
Reproduced with the permission of Historisches Museum Basel - Inv.-No. 1897.48. I have been working hard on my lino-cutting course- trying to make as many examples as I can to illustrate what I have written. The notes are starting to turn into a book at the rate I am going- who knows I may make it into a book!. There is still a couple of places available in my next course starting on 14 August if anyone is interested. Course price is $30US and comprises of three lessons delivered in two weekly intervals. The first group have made some wonderful work already, and their enthusiasm is very infectious! Thank you! I did however want to share the Sion textile with my blog readers. 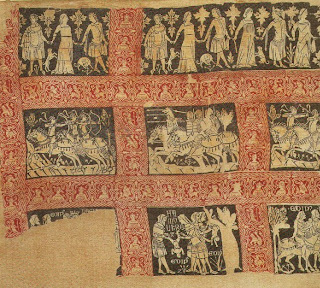 Most of you have probably never heard of this textile but it is said to be the oldest European printed textile and was found at Sion in Switzerland, though it is believed dto have been made in Venice. it is a large fragement measuring about 2 metres and this small section shows a few of the blocks that were printed-the piece is two coloured and the imagery represents the Eoedipus cycle. It dates from the second half of the Fourteetnth century. It is now housed at the Historical Museum in Basel but sadly won't be on display this year or in 2010- I asked! I found it in a book I purchased some time ago called the Origins of European Printmaking.I have given a link to Book Depository Co- they are a British company who supply books worldwide and the shipping is free!! I have never had a delivery take longer than 7 days- so am a very happy customer. I have been working on making lots of lino-cuts and this one is inspired by Jumeiux Cathedral in Normandy. It is said that William the Conqueror set out from Jumieux Cathedral on his quest to invade England. Anyway it is a most delightful ruin in a delightful little village. We took a lot of photos as I am especially fond of arches and arches framed within arches. The intention has been to make a quilt inspired by the rui but for now a linocut will have to do! And I am now taking bookings for my next lino-cut course which will start on August 14 which is a friday. The course will consist of three fortnightly sessions looking at linocutting and developing your own imagery. The cost is $30 US for the three sessions. If you are on my waiting list I shall be in touch with you soon. Bleak horrid weather outside- but the rain is needed and I slowly see dams that dried out last summer filling up again slowly. I have been doodling in my journal , playing around with lines for linocutting. The flowers are inspired by lace, and the face by an image of Mary from the St Serge Convent in Maloula by Michel of Crete ( 1813). I love the detail of ornamentation on the icon image. I have been quiet- life has gotten busy and I have been desperately trying to finish my quilt so that I can send the entry to EPM Concours. The photo is of a snippet of the quilt- can't really show you the whole- but I did use the three colours of the flag- just changed them into a much nicer red and blue! We have also started our on-line lino cutting course and that has been fun.Developing the work for the course has been a good exercise- it has really pushed me to look hard at design, which is not a bad thing!I will definitely be doing another on-line course starting sometime in August- I already have a waiting list. 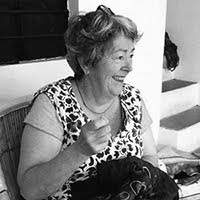 And on another note- Fiona Wright from Creative Art Safari's and I have been working/dreaming on a tour we will do in August 2010 of England and Belgium inspired by the Arts & Craft Movement. The design elements of the movement fit in nicely with the lino-cutting work I am doing) So I am also looking at the philosophy underlying the movement- revisiting John Ruskin ( whose work I so briefly encountered when doing my masters)I love researching things- it fulfills the intellectual side of doing. However I am enjoying the directions the cutting is pushing me in with this concentrated effort at creating blocks. Now to make a book with worthy content... I mean a book with images- a hand made book.